What If Your Life Were Totally Different? THE THINKING WOMAN’S GUIDE TO REAL MAGICReview, Q and A and Giveaway! Provided by publisher for fair review in virtual tour.No Remuneration was exchange and all opinions herein are my own except as noted. You can follow Emily on twitter (@EmilyCroyBarker) and connect with her on Facebook and http://emilycroybarker.com/. Nora’s life is not quite going as planned. The man of her dreams is getting married, but not to her; her academic career has stalled; and there’s a mouse in her kitchen… Getting away for the weekend for a friend’s wedding seems like perfect timing, especially when she stumbles across the unfeasibly glamorous Ilissa, who immediately takes Nora under her wing. Through Ilissa, Nora is introduced to a whole new world – a world of unbelievable decadence and riches where time is meaningless and everyone is beautiful. And Nora herself feels different: more attractive; more talented; more popular….Yet something doesn’t quite ring true: Was she really talking to Oscar Wilde at Ilissa’s party last night? Or transported from New York to Paris in the blink of an eye? It is only after Ilissa’s son, Raclin, asks Nora to marry him that the truth about her new friends becomes apparent. By then, though, it’s too late, and Nora may never be able to return to the world, and the life, she knew before. If she is to escape Raclin and Ilissa’s clutches, her only real hope – and an unlikely one at that – is the magician Aruendiel. A grim, reclusive figure with a biting tongue and a shrouded past, he might just teach her what she needs to survive and perhaps even make it home: the art of real magic. This novel is remarkable: it has such depth, emotive content, and sparkle. It’s as skillfully written as any piece of literary fiction with paranormal overtones I have read in the past few years. I shouldn’t have been surprised; poetry is the heroine’s area of expertise. World building: The world is rich, different, unmapped, and nebulous enough that understanding it is easy and being able to mentally map it is unimportant. There are languages, but fortunately we don’t have to know them. The character’s names are unusual, but distinct enough that while I might have wondered about their pronunciation I didn’t have a hard time remembering who’s who. It’s familiar enough that north is north and a hand is a hand, a bird a bird, and an asshat is still an asshat (regardless of cultural endorsement). Relationships: Slowly built relationships are the easiest for the reader to believe and understand. How does someone become a friend; earn your trust, care if you leave, treat you like an equal? Other relationships are important but happen in an instant when required. Throughout the book Nora’s relationships to other characters are usually built slowly, over time. A random near hook-up and a brave knight neither of whom know her well enough to get what they would like from her. Natural: which understands reality and channels the materials in it to behave in a certain way. Magicians who can grasp the nature of things, and therefore reality and manipulate it. Wizards: People who utilize spells to force demons and ghosts to do their bidding. Diversity and forms of intelligence: Nora is told that she is a good “close” reader of poetry, but fails to grasp the larger concepts. In the academic world of thesis commitees and fellowships this is not a good thing. But in Aruendiel’s world, seeing things well, having good observational skills and focus is vital to performing magic. At the crux of the entire novel is a sort of lion and mouse fable. Nora one morning saves a mouse from a glue trap. That is never stated to be the way her wishes are granted. She wishes her life were different, she chooses a path. The adage to “be careful what you wish for” comes into play, as does “watch where you are going.” I don’t believe Nora ever realizes that these events have begun the entire cascade that changes her life and, more importantly, changes her. Also of interest to me was the idea that sometimes we wish carelessly, but the universe has a way of balancing wants and needs — especially in fairy tales. And, this is a sort of fairy tale/nightmare/dream. The plot is well conceived and realized. This might sound crazy, but I often feel a writer had the idea of a beginning for a novel but hadn’t really conceived of where they wanted it to go, or sometimes how to get the book from beginning to end. This never, ever feels less that perfectly plotted. It is a longish novel, but while it slows sometimes in the relationship between Nora, Aruendiel, and Magic, it never gets bogged down and everything leads you through the story. These really interesting subtle ideas go on and on and you deserve to discover them for yourself. Nora asks important and insightful questions that help define what magic is and how it works. She asks important questions, period. That also shouldn’t surprise — While this is Emily Croy Barker’s first novel, she has been a magazine journalist for 20 years. A Harvard graduate, she is currently executive editor at The American Lawyer magazine. It seems like a journalist would need to be able to ask good questions! I Highly Recommend THE THINKING WOMAN’S GUIDE TO REAL MAGIC. For lovers of more literary, subtly magical tales this is actually A MUST READ. I am really excited to have had a chance to ask Emily Barker Croy some questions. Thanks Emily and the Penguin Group for including me in the tour. I’m wondering about that “Sadly.” I thought part of the story was about the pitfalls of magic. Would you like to have the ability to practice magic knowing what could go wrong? What kind of magic would you like to be able to do? Emily: Yes, I’d love to be able to practice magic—real magic—although so far it has been beyond my capabilities. As you know, in my novel real or natural magic is distinct from wizardry, in which the practitioner recites spells that force a spirit or demon to do his bidding. Real magic involves drawing power from natural elements and using it to work your will. To be honest, recent technology makes a lot of magic obsolete. (Imagine being able to carry a whole library around in a box smaller than your hand! Well, now you can.) But real magic carries other benefits, according to my character Nora. As she says to another character, Perin: “Practicing magic takes a kind of awareness you don’t feel ordinarily. You have to really know the things around you and make them know you. And when you manage that connection, it’s as though the world belongs to you. You feel more at home in it. As though you could do anything.” I think that writers and other artists can come close to the same sense of connection, exaltation, and yes, power when they create something new from their observations of the world around them. You’re right, a lot of the story is about the pitfalls of magic. But those problems usually come from human error or misjudgement, not from magic itself. 2. Aruendiel can perform all sorts of amazing feats yet lives simply, almost in poverty. He could easily, without too much effort change his living conditions. Why does he live, more or less, ascetically? Also, I think the communication with natural elements in real magic goes two ways. When Aruendiel is drawing magical power from the forest, communing with the trees, he is also making a sort of unspoken pledge to use that power conservatively, not to spend it recklessly. 3. It feels as if Nora is flailing in her studies, something I totally remember from grad school. Is Nora really in love with the English Lit degree or is she marking time until she finds a vocation. Is a lack of commitment what has really kept her from her degree. Is magic her vocation? Emily: I don’t think it’s lack of commitment that has kept Nora from her degree as much as a creeping sense of disillusionment with her studies. I think she went to grad school with great hopes and lots of idealism and then discovered that it’s really technical school for future English professors—at least her program is. Part of her problem, too, is that she just hasn’t done that well in grad school. She hasn’t quite mastered the right analytical style—she’s still more interested in doing close readings of poems than in theory—or learned how to play academic politics. If she were more successful, no doubt she’d like graduate school more. Yes, I do think magic is her vocation, one that plays to her strengths more than delivering papers at academic conferences. But she still has a lot to learn about magic. In some ways, the first book was about acquiring power; the second book will be about how to use that power once you have it. a. Did you set out to write a series, or did it become one as you wrote or in editing? b. What are the plans for the series? How many books are planned? c. Will they stick with Nora and Aruendiel or will they move on to other characters? Emily: As I was writing what became The Thinking Woman’s Guide to Real Magic, I always thought that there might be more to tell about Nora and Aruendiel beyond the tale I was working on. But this story took a definitive turn toward becoming a series while I was revising it. My first draft was incredibly, ridiculously long; I cut about 50,000 words before I sent it to my agent, but it was still almost 1,000 manuscript pages long. She had the brilliant idea of taking out the last 200 pages and saving them for a second book. Voilà, a series. So I’m about halfway through Book 2 at this point—building on those 200 pages—and I have some ideas for Book 3. I’m still very interested in what happens to Nora and Aruendiel, so they will continue to be important characters. But there are several other characters from The Thinking Woman’s Guide to Real Magic—some mentioned only briefly—whom I’d like to know more about. I suspect they’ll play a larger role in the books to come. 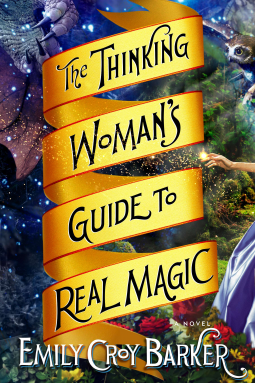 1 Hardcover Copy of a THINKING WOMAN’S GUIDE TO REAL MAGIC This is an AWESOME prize! If you tweet please make sure the URL Twitter/Rafflecopter puts in is http://fangswandsandfairydust.blogspot.com/2013/08/Thinking.html for it to count. If you follow by email you must follow through with the confirmation. You must use the Rafflecopter form to enter. « What Else is On Tap This Week? THE MY BODY TRILOGY THURSDAY! » A Dramatic Backdrop! TAKEN BY THE VAMPIRE KING Review and GIVEAWAY!